Here is a great Interchangeable Lens Eliminator Series Goggle kit that comes complete 3 lens sets. 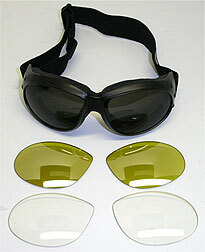 Lenses pop out and snap in easily so you can switch on the fly from dark daytime to clear or yellow nightime lenses. These Interchangeable Lens Motorcycle Goggles also feature a wide panoramic field of vision and are made with Impact Resistant Polycarbonate lenses that exceed the UV-400 specs to give the wearer 100% UV-protection and then some. Included with the Eliminator kits are a zippered pouch for the 3 lens set with special compartments for spare lenses. Great goggles that do it all at one great price! To order replacement lenses Click Here!! !